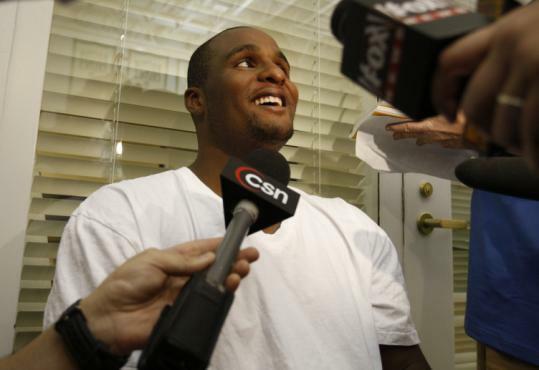 WALTHAM - Glen Davis didn't feel this comfortable at this time last year. Yesterday, he sat down and stretched out his legs as he answered questions after the first day of the Celtics' rookie/free agent minicamp. Davis and guard Gabe Pruitt were the "veterans," the only Celtics from this past season's team taking part. None of the assembled players had more than two years of NBA experience, and all were hoping to make a lasting impression. Only one year removed from his introduction to the Celtics, Davis said he remembers the feelings of uncertainty in his first year out of Louisiana State. "I just remember not knowing what's going on here," said Davis. "The biggest thing was being clueless about what's going on and not getting a feel. Just wet behind the ears." The feelings weren't much different for Pruitt, who was the 32d overall pick last season. Although Pruitt didn't play much this past season, he said knowing what to expect should help him. "I was a little jittery," Pruitt said. "I was new to the league and playing with guys like [Paul Pierce, Kevin Garnett, and Ray Allen]. It took me awhile to get used to it. The difference between then and now is that right now I have a lot more confidence coming in and feel a little more comfortable. I know what to expect." Pruitt did not play in the playoffs and during the regular season played in just 15 games, averaging 6.3 minutes and 2.1 points. Defensively, he said he is eager to prove that he deserves to be on the court. Assistant coach Armond Hill described Pruitt as "polished" after yesterday's workout, and general manager Danny Ainge praised his growth as a player. "Gabe looked good," Ainge said. "I think in as much as his body looks better than it did a year ago, he's more confident in his game and his shot. But it's one practice." If there was a road map for Pruitt to follow, he would look to the path of teammate Rajon Rondo, who started in his second season and helped the Celtics capture their 17th NBA title. "Rondo made a huge step from Year 1 to Year 2," Pruitt said. "I look at that and say, 'That can be me.' I do use Rondo as sort of my guidance along the way." But getting to that step will only come if Pruitt can gain the trust of the coaching staff. "I just feel I need to build the confidence of the coaches in me to come in and say they can trust me on the floor, and they can just put me in there and have a lot of confidence in me coming in and performing," Pruitt said. The first day tends to bring out the most in players, as the roster included forward Randolph Morris, who was with the Knicks this past season, and guard David Noel, who was last with the Bucks. Hill said players were challenged in different offensive and defensive sets to see how well they can listen and execute. "They're just going very hard," Hill said. "They're almost going too hard. They're going at a blinding speed. We just want them to slow up two seconds. If they could slow up, we could see a little bit more of them." Free agent center Chris Andersen and his agent, Steve Heumann, arrived in Boston yesterday, had dinner with Ainge, and will meet with Ainge and his staff today. The Hornets are also interested in retaining Andersen. Free agents can begin signing contracts Tuesday. The Celtics have had an interest in Andersen since he was reinstated by the NBA March 4 after serving a two-year ban for violating the league's substance abuse policy. The athletic, 6-foot-11-inch, 228-pounder returned to the Hornets and played in five games. Andersen, who has also played for the Nuggets, has averaged 5 points, 4.7 rebounds, and 1.3 blocks over his six-year career. "He's a guy we've always wanted," Ainge said. "We just want to sit down and talk to Chris and see where he is at with his desire to play in Boston and to see if we think he is a fit." Agent Mark Bartelstein, who represents forward James Posey and guard Eddie House, said yesterday, "Nothing new right now. Just a lot of talk." "There is a lot of posturing going on," said Ainge about free agency in general. "Who knows?" The Celtics have offered contracts to both Posey and Clippers free agent guard Corey Maggette, who are both getting interest around the league. Sources indicated Posey was not offered the full midlevel exception (about $5.8 million) by the Celtics, but it wasn't far from it. Among the teams expected to be interested in Posey are Washington, Cleveland, New Orleans, and the Los Angeles Lakers. When asked when he expected to get word from Posey or Maggette, Ainge said, "I don't know. I just don't know." "Our finished work might not be done until August or September," Ainge continued. "It's a long process. We are going to try to sift through a lot of free agents. We are in a good position where a lot of guys want to come and play for us. It makes it good. It doesn't make us desperate." As of yesterday afternoon, first-round pick J.R. Giddens had not signed a contract, and as a result had not participated in minicamp. "It would be nice if J.R. were here," Ainge said. "Gabe and [Davis] are getting a lot out of it. We're getting a chance to see a lot of other guys. It's not the end of the world, but it would be better if he were here, sure, for him." In the meantime, Giddens is working out in Dallas. "Once we get his contract signed, J.R. will be excited to be a part of any and all workouts," said his agent, Aaron Mintz. Center Kendrick Perkins and rookie forward Bill Walker each had successful arthroscopic surgery yesterday at New England Baptist Hospital, according to the team. Perkins underwent surgery on his left shoulder, which he injured during the playoffs. Walker had surgery on his right knee, a minor injury suffered in a predraft workout. Ainge said he expects Walker to resume basketball workouts in about four weeks.